What I can show you… is the beautiful embroidered quilt above. I’m working on it today. I’ve been working up to this one. 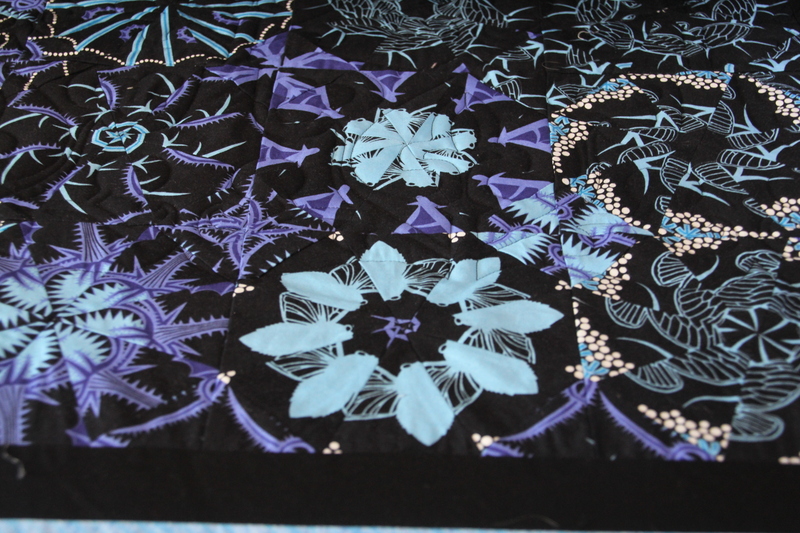 Intricate designs are a natural for custom quilting. The stitches and the stabilizer add quite a bit of bulk in those areas, so I knew I would have to do a lot of stitch-in-the-ditch (SID) quilting. I know what you’re thinking… That’s pretty easy, right? Well, not exactly. Straight lines are some of the most difficult quilting, since you can tell if it’s not quite straight. Also, I am pretty particular which quilts will be a candidate for this type of stitching. If the piecing is not really precise, SID will just accentuate the flaws in the piecing. This quilt, however, is pieced very well. I am writing this post, as I’m taking a break. I just completed the SID, and started the free-motion work on the top border. The great part about stabilizing the quilt with SID, is that now, I can jump around to any area, and work on it, without the fear of running into a problem with pushing extra bulk into the wrong area. I think I’ll mostly free-hand this quilt, except for the yellow background areas around the central star. I think the robot can do a little work too! To coincide with my Photo blogging project, I have also signed up for a daily blogging project. Today’s prompt was to tell a second-hand story. As a professional long-arm quilter, I hear stories all the time. I hear about the journey that the quilt-maker has undertaken to produce the quilt top in front of me. I hear about quilt classes and retreats. I hear about wonderful shopping trips to quilt stores, large and small. I am told about family and friends, celebrations and trials. One of my clients, named Karen tells some great stories with her quilts. She has made four of these quilts so far. The story goes as such. She inherited her mother’s fabric stash, and as a sewer herself, Karen had accumulated quite a collection of scraps herself. These scraps are dated from the 1930’s to today, and are everything from scraps from clothing projects, quilt fabrics, recycled clothing and draperies, and t-shirt logos. The process is pretty straight forward. Karen cuts the fabrics into equal sized squares. I believe hers were about 4 inches square. Mind you… you fit a lot of various fabrics that size into a king-size quilt. These fabrics all have meaning to Karen and her three sons, who each now have a quilt of memories. I only got a brief story about the fabrics in general, but as I quilted each quilt, I could imagine a few generations of life through their energy. I could tell that this square was likely a curtain at one time. Oh, this was surely a kids shirt in the 1980’s. I love the pattern on that… it must have been popular in the 1950’s. Some squares were more obvious. There were patches cut from old family reunion t-shirts. There were sports team logos, and cartoon characters. It was so much fun to “read” the stories presented in these quilt tops. I am a lucky artist indeed. I’ve been keeping up with my new commitment to sewing/quilting every day. I have been diligently working on my blocks for the Blue Ridge Beauty that I started at a class in mid-June. I’ve decided to make the central portion of the quilt about one-third larger to accommodate the king-size beds we have in our home. Soooo…. I need to make 256 of these pieced blocks. That meant I needed to make 512 half-square triangle units, and 512 4-patch units. I did the half-square triangles first, and I’ve had them ready for a couple of weeks. I started making the four-patches by sewing two strips together. I cut all of this quilt out of some fat quarter collections that have been gracing my stash for several years. They are awesome… part of the Daiwabo taupe collections that are so popular right now. 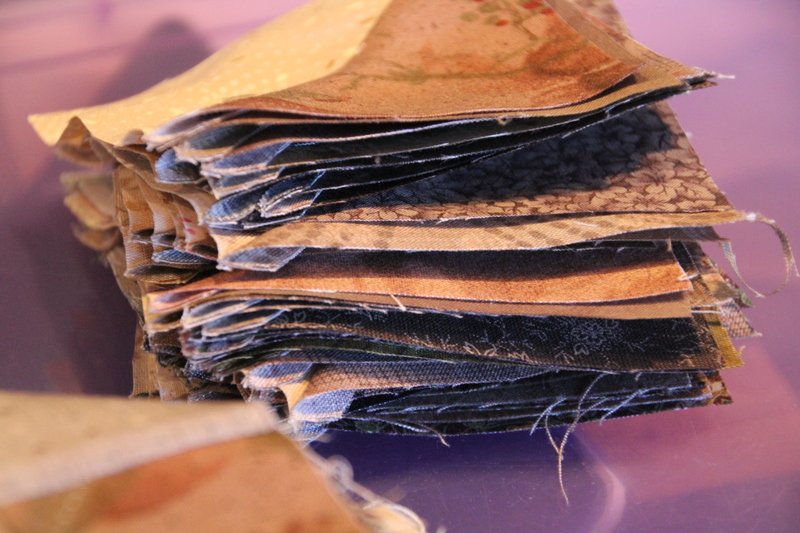 Since they began as fat quarters, the strips were only 20ish inches long. This allowed me to create a very scrappy combination of 4-patches. Then I cut the sewn strips into sections equal to the original strip width. Once this was done, I paired up random units, to create the four-patches. It seems like I’ve been making them for quite a while. Alas, they are finished. 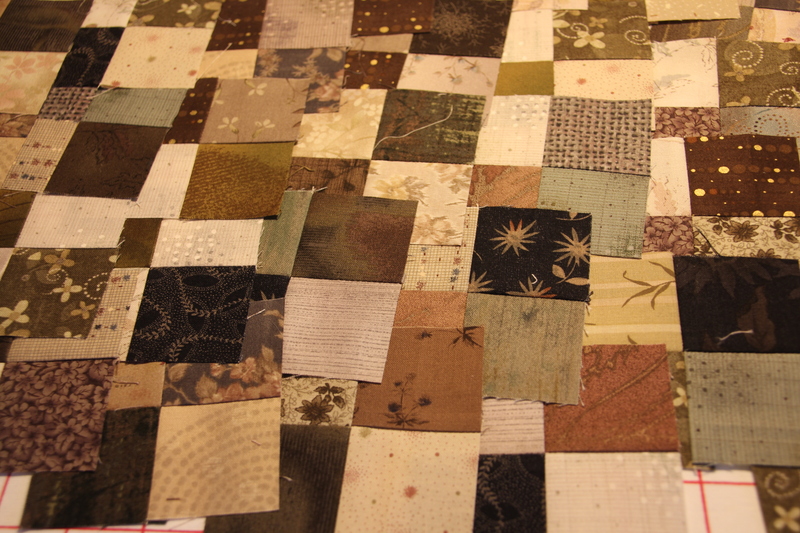 Now, I take two half-square units and two four-patches to make a block. Then another, and another…. Right now, I’ve got 103 blocks done, of the 256… Oh boy! I must say, I love the way this is turning out. I did have one scare along the way… I think I was going to run out of fabric…. Hard to believe, looking at my stash. I almost called the store where I purchased this fabric, hoping they might still have some more. Then I told myself to go look again in the stash. I found two fat-quarters that blend in perfectly with the collection. See, it does pay to buy fabric ahead! I’m also working on my customer quilts this week. It’s really fun to be challenged to work on a variety of projects. I’ve quilted two stack-and-whack quilts for my good friend, Annie B. The first one, made of a poppy print was set off nicely with a brilliant green stripe fabric that she used for her sashings. I forgot to photograph it, so you’ll have to go to her blog on www.highplainsquilting.com and perhaps she’ll upload something. Her second quilt used the “oxygen” fabric line. It really has such great movement to the blocks, and Anne Bright recently released a terrific edge to edge design called Alexis that seems to have been made for this one particular quilt. Thanks Anne Bright!!! If you look closely, you’ll see that Annie B. ingeniously pieced her backing, using her leftovers from the project, and making the quilt a i beauty. n choosing designs to complement the quilt, and this quilt kept saying “nautical” to me. I found a really cool sailboat with a star on the sail in a pattern by Ellen Munnich. I called Mark, and he thought that sounded good…. plus he said I always choose well. Thanks for the compliment!!! Well, that’s what I’m up to. What are you working on? Leave a comment and let me and my readers know…. This quilt belongs to Melanie, a member of the Carousel Quilt Guild in Burlington, Colorado. 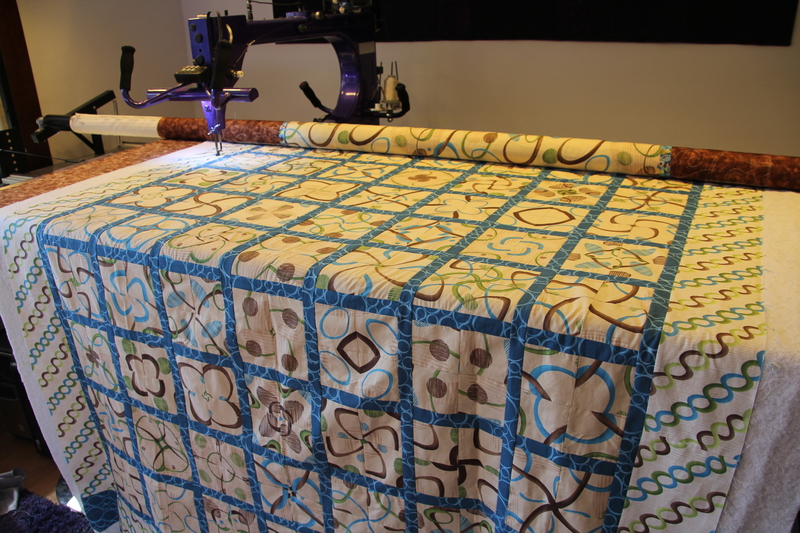 It was a class taught by Junelle Hills from the Quilt Cabin in Colby, Kansas called the Jelly Roll Race Quilt. Today, I’m getting a break from my duties at Foltmer Drug and RadioShack, so that I can pursue some quilting for my upcoming customers. WOO HOO! This quilt is awesome. I love the colors, and it’s made entirely of batik fabrics. 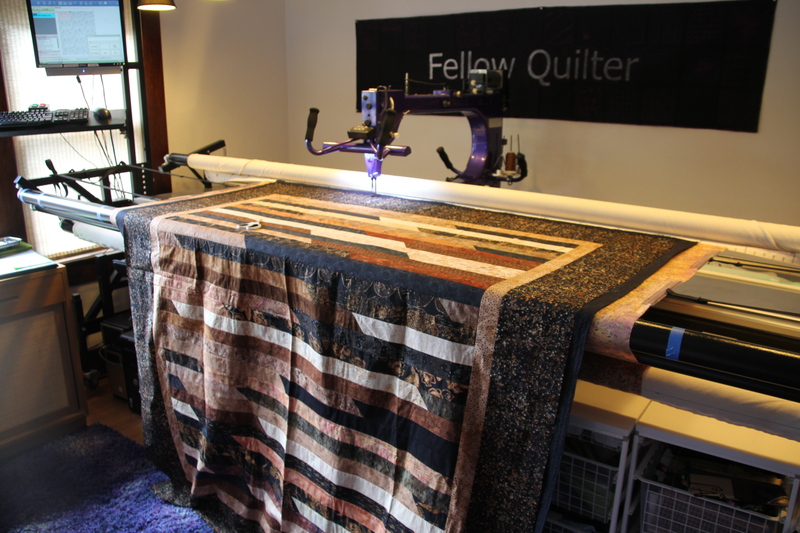 The quilt is called the Jelly Roll Race Quilt. Because of the beatiful oak leaves and acorns design, and the colors of the batik fabrics, a King Tut variegated thread was chosen to complement the quilt. Superior Threads has a website at www.superiorthreads.com and many sewing and quilting shops carry their thread. I subscribe to their monthly newsletter for the great thread education, but also for the joke of the month… which is always super funny, and a joke that I can tell at work. Here is a closeup of the quilting design. You can see the beauty of the batiks, and the richness of the pattern and color. I chose to use a black batting, since there are no areas of white in the quilt. That way, if the batting ever beards out after washing, it will be less noticeable. Maybe you’re not yet familiar with that term. Bearding is the term to describe when little fibers of batting escape from inside the quilt, usually through the needle holes made while quilting, or through a seam that has been pressed open. They can be a bother, and can take away from the beauty of your quilt. The other tip for this day is to realize that batiks are much tighter woven than your traditional cotton fabrics, say from Moda or Benartex, etc. As a result, if you have to rip out stitches, there will still be holes where the needle sewed the fabric. If you rip out on a batik, you should try your best to resew exactly over the same stitching line to hide those holes. Just a little thing, but it’s the little things that set your quilt apart. Thanks for reading! I love looking at other artists studios. So… I thought you’d like a peek into mine. As you see “Artie” is busy stitching out a design on my latest customer’s quilt. Actually, that reminds me… This customer, Benita from Greeley, Colorado asked me to quilt a dear sentiment on her quilt. I thought this phrase was so awesome. Really fits with the puzzle theme of this sudoku quilt pattern for sure. It took some time to quilt, being that each letter is stiched out as an individual pattern, but the end result is marvelous. I hope you like the peek at my studio, and especially a glimpse into this quilt’s legacy. I just finished my last quilt before the move. Well, I’ve finally completed the last quilt in my queue. As you may or may not know, I’m preparing to move my studio across town. With this accomplishment, now I can move forward with the dismantling, moving and resetting my Gammill with Statler Stitcher. His name is Artie, by the way. 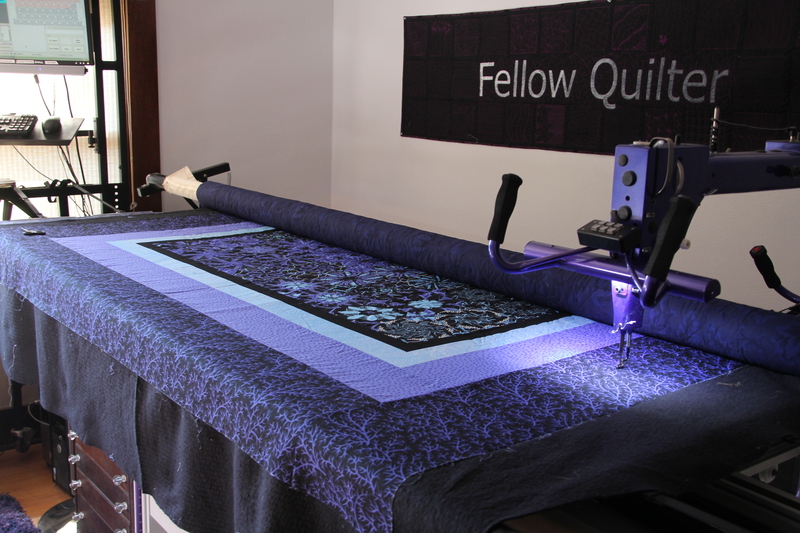 His robotics and system really allow me to have fun putting my spin on many, many customer quilts. 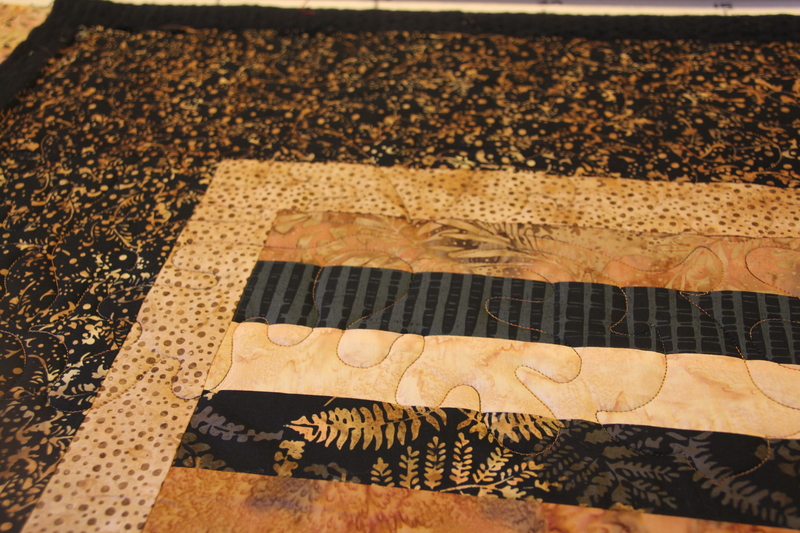 Every once in a while, I even get to work on one of my own quilts, too! I guess that’s all I’ve got to report tonight. Have fun… Do something creative!! !